The BBC is running “History Will Be made”, a marketing campaign for the 2018 FIFA World Cup to be held in Russia. Every World Cup has a host of iconic moments and everyone has their own individual favourite that immediately takes you back to that time and place. The campaign trailer, “The Tapestry”, takes a journey through World Cup history via the skill of Diego Maradona, the flair of Zinedine Zidane and the emotion of Paul Gascoigne, with a preview of the most exciting talents of this year’s finals including Cristiano Ronaldo, Lionel Messi and Harry Kane. The BBC Tapestry film is only the beginning of a campaign which will continue through to the end of the 2018 FIFA World Cup series in Russia. Every single frame in the BBC Tapestry film was individually embroidered. More than 227,000 metres of thread were used to create over 600 unique frames of tapestry, that if laid end-to-end would measure over 1,200 metres in length. This visual style will then become the look and feel for the BBC’s coverage, extending into programming graphics, website design, social media, BBC One’s look, and more. The idea will be fully realised in a real 7-metre long tapestry that will be put on public display. 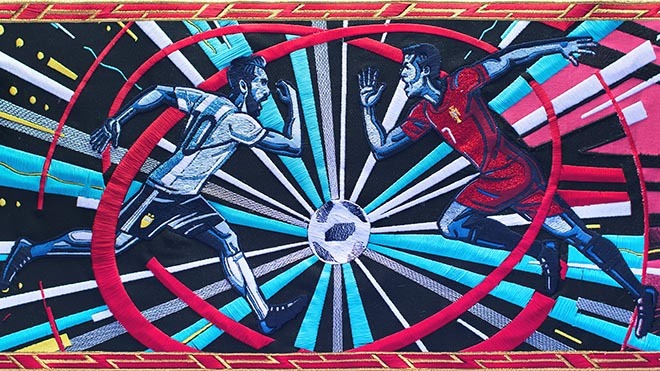 Moments from this year’s competition will be added to the tapestry after the tournament’s completion, creating a historical record of the 2018 World Cup. The launch film’s accompanying music is Ochi Cheryne – a traditional Russian folk song in keeping with the historical theme of the campaign. The song was recorded at Abbey Road Studios, arranged by Alex Baranowski, and features distinguished bass-baritone Sir John Tomlinson alongside a 40-piece orchestra. The lyrics speak of unification and friendship – the ambition of the World Cup itself. The BBC World Cup Tapestry campaign was developed at BBC Sport Marketing and BBC Creative by portfolio head of marketing James Parry, marketing manager John Spratt, marketing executive Helen Worsey, campaign planner David Wheadon, media portfolio lead Marc Jones, executive creative directors Aidan McClure and Laurent Simon, creative directors Tim Jones and James Cross, creatives Edward Usher and Xander Hart, producer Liz Dolan, project manager Loretta Ramkissoon, production coordinator Emma Hamilton, head of planning Mike Lean. Filming was shot by director Nicos Livesey via Blinkink with producer Alex Halley, executive producer Bart Yates, designer Luke Carpenter, and BBC Creative head of design Laurence Honderick. Sound was designed and mixed by Mark Hills and Anthony Moore at Factory with producer Lucy Spong. Music, “Ochi Cheryne”, was arranged by composer Alex Baranowski, performed by Sir John Tomlinson and the London Metropolitan Orchestra, recorded at Abbey Road Studios.